The geologic column and the fossil record was believed to have represented the ages of the earth, starting with the most recent age at the surface of the earth and as you move drill down into the earths sedimentary layers of rocks, past ages are supposed to be represented. Full of inconsistencies, the geologic column is no longer a reliable source for the theory of evolution. Scientific methodology and observation combined with the evidence found throughout the sedimentary layers provides reliable evidence to complete a more accurate model for past global catastrophic events and for the Biblical flood of Noah. Uniformitarians assume that the slow rate of sedimentary buildup seen today has remain consistent throughout all of time, calculating backwards, they believe each sedimentary layer to be millions to billions of years old, all the way to the lowest sedimentary layers. Catastrophists believe the earths sedimentary layers where deposited very rapidly in global or large geographic catastrophic events. 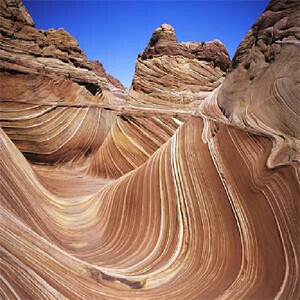 In Geology, uniformitarianism is the doctrine that proposes that all changes in the earth’s surface occurring in past geologic time are referable to the same causes and changes being produced as observed on the earth’s surface today. i.e. Geologic conditions and sediments are being observed today to lay down in a very slow manner, therefore it is believed that they must have always ‘uniformly’ been laid down very slowly at the same rate all throughout the earths history. 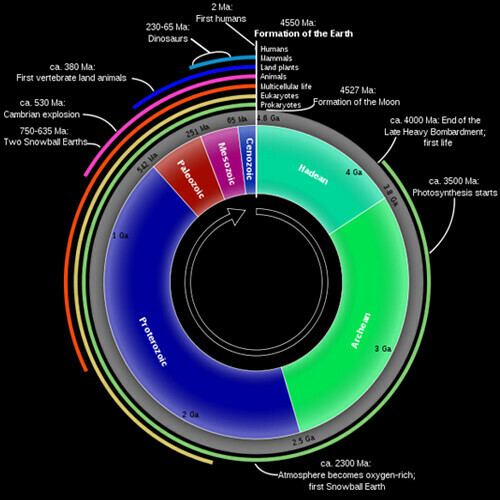 This is the origin of the belief the earth and each of its layers are denoted by a timeframe of millions of years. The theory of uniformitarianism was proposed by James Hutton in the “Theory of the Earth” in 1795. This was developed further by Charles Lyell in “Principles of Geology,” which was first published in 1830. That book had a profound influence on Charles Darwin, whom, when he had read it several times mentioned in several of his writings how it excited him and changed his entire outlook on life. This gave him the ideas that led to his theory of evolution, and the explanation for the millions of years that he needed to complete his theory. In Geology, catastrophism is generally described as the doctrine that at specific intervals in the earth’s history, all living things had been destroyed by cataclysms. These cataclysms would have been severely detrimental, causing extreme disorientation of the earths geological features. Mountains, valleys and all kinds of physical changes would be made throughout the earths surface. The theory, popularly accepted from the earliest times, was attacked in the late 18th century most notably by James Hutton. Catastrophism is typically associated with Biblical doctrines, such as the account of Noah’s Flood. Catastrophism had remained for some time the interpretation of the earth’s history, and was accepted by the great majority of geologists (Whitcomb and Morris, 1998). Evidence today is once again pointing to this kind of interpretation, as geological evidence continues to point towards a Worldwide Global Flood. The Geologic Column is one of the primary systems evolutionists use as a foundation for everything they believe in. 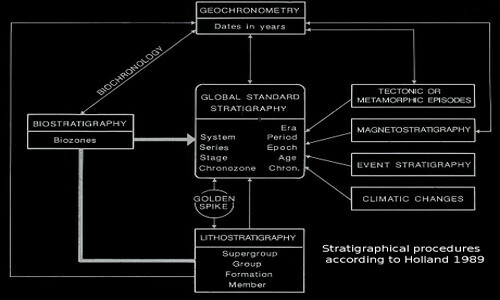 The geologic columns, or geologic timescale, is a system that theoretically charts the time frame for each of the strata layers, all in attempt to measure a date for when each layer of the earth was formed. The Geologic column is the known by some as the ‘Bible’ for the evolutionist, as it theoretically portrays their interpretation of history, and is used to base their belief system. Geologists state that a complete geologic column would be roughly 100mi thick, twice the depth of the crust of the earth, yet the typical depth of the columns found/ drilled are merely 1mi deep. No where on earth is the entire geologic column complete as shown in any geologic column chart. It is pieced together through theory, interpretations and educated guesswork. 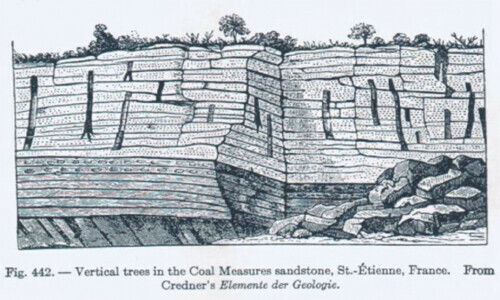 One of the primary contributors to the Geologic Column is William Smith, whom in 1815 produced a geologic map of England with statements of the fossils found in defining order of the strata. These definitions of the geologic columns have changed little since then. The geologic column was initially constructed based on fossils, typically known as index fossils. Places where rocks do not contain fossils, dating and other relation techniques are used to determine the age. This chart from Holland contains the various links used to construct the column. Q. 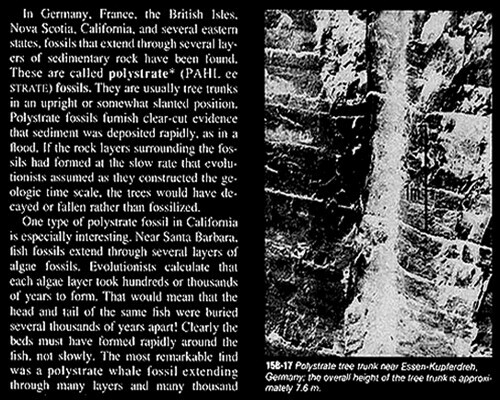 This geologic column has had little adjustment since it was created, before any radio dating method was available, so how was it, that these geophysicists from the 1800’s where able to give the dates and time ranges they came up with (i.e. millions – billions of years)? A. Charles Darwin whom didn’t like to give round numbers, used ‘educated’ guesswork to developed many of the ‘old age’ numbers that he used in his literature. Literally using the numbers that ‘seemed’ for each time era (i.e 3,752,271 – 11,571 years). Geologists of that day could only assume a uniform deposit of the sediments that formed the layers of earth they observed, calculating backwards to get the extremely long years that we still use today. In the early 1800’s each layer of rock was dates according to a given Geological Period (i.e. Cambrian, Devonian, Mississippian) by various evolutionists starting with from William Smith. Once Charles Darwin began to propose his theories, an age and an index fossil was assigned to each of the geologic periods represented layer, and where than organized based on the dates assumed to be represented in the geologic column. 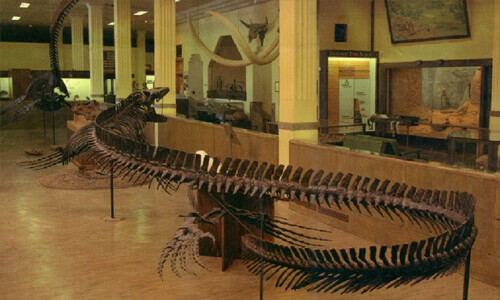 A total of 34 ‘index fossils’ where officially used to determine the timeframe of each layer. These fossil where selected because it was believed they had short lived time periods on earth, due to the research at the time showing they where ‘relatively’ in the same strata layer in every ‘known’ location. Another requirement was that the index fossils (aka ‘time marker’) are generally different from organisms found in other strata. How can you tell the age of a rock, or to which geologic time period it belongs? 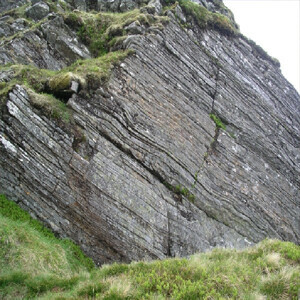 How can you look at a strata layer and know ‘WHEN’ it formed? Evolutionists teach that the fossils date the geologic columns, and the geologic columns date the fossils. They use circular reasoning to determine the dates of each piece of evidence they are attempting to validate. 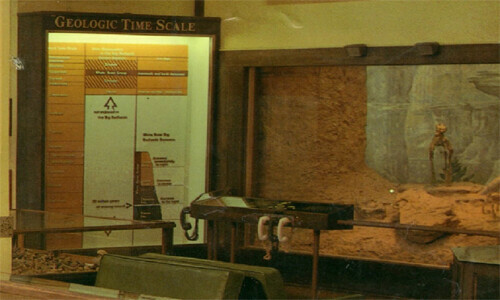 School of Mines Museum, Rapid City, S.D. “Ever since William Smith at the beginning of the 19th century, fossils have been and still are the best and most accurate method of dating and correlating the rocks in which they occur.” – Ager, Derek V., “Fossil Frustrations,” New Scientist, vol. 100 (November 10, 1983), p. 425. “The geologist has never bothered to think of a good reply, feeling the explanations are not worth the trouble as long as the work brings results.” – J.E. O’Rourke, American Journal of Science 1976, 276:51 – See also In the Beginning by Walt Brown p. 64 Avail. From CSE. 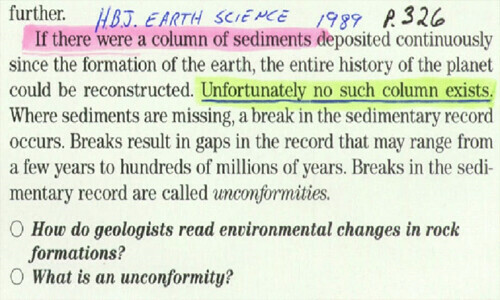 Here we can see even in the science text book that this geologic time column is known to be both circular reasoning and false; therefore they make statements attempting to explain it. Q. 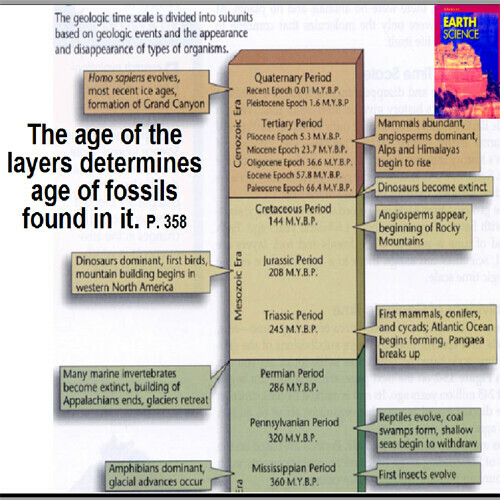 How long does each of the layers observed in the geologic columns really represent? Q. Was each layer deposited over millions of years, or very quickly represented by a flood model? Unbiased examination and experimentation needs to take place in order to determine what the expected results would be if the earths strata layers where either laid down quickly, or over millions of years. If each of the layers in the geologic column really represented millions of years of deposit, why do we find very little erosion between each layer, if any at all? In fact we observe almost all sedimentary layers to be uniformly flush with its preceding layer. How could no evidence of erosion exist between each sedimentary layer if millions of years had passed between each deposit? We have evidence of countless torrential weather patterns that existed in the past, yet entire sedimentary layers are found in ‘perfectly’ straight lines, supposedly calculating to thousands of years per each inch! Where Are The Layers of the Geologic Column? Pre-Cambrian – c. 500 million to 1.8 billion years ago – Primitive water dwelling plants and animals. Paleozoic era – c. 200 million to 500 million years ago. Cambrian – All sub-kingdoms of invertebrates animals represented. Brachiopods and trilobites common. Ordovician – Earliest known vertebrates. Graptolites, corals, cephalopods, brachiopods, and trilobites abundant. Oldest primitive land plants. Silurian – Earliest known land animals. Primitive land plants. Rise of fishes. Devonian – First known seed plants. Great variety of boneless fish. First evidence of amphibians. Pennsylvanian – Earliest know insects. Spore plants abundant. Permian – Rise of primitive reptiles. cycads and conifers. Extinction of trilobites. First modern corals. Mesozoic era – c. 70 million to 200 million years ago. Triassic – Earliest dinosaurs, flying reptiles, marine reptiles and primitive mammals. Jurassic – First (reptilian) birds. First of highest form of insects. First (primitive) angiosperms. Cretaceous – Modernized angiosperms and insects abundant. Foraminifers profuse. Extinction of the dinosaurs, flying reptiles and ammonites. Cenozoic (Tertiary) – c. 12 to 70 million years ago. Rise of mammals and development of highest plants. Cenozoic (Quarternary) – c. 25,000 to 975,000 years ago. Rise of modern plans and animals and man. 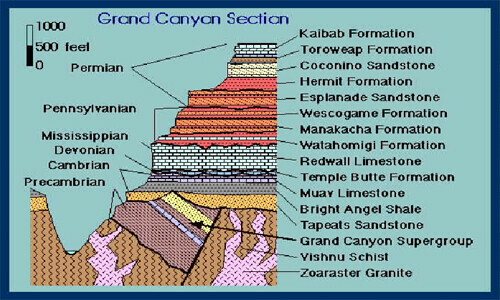 The layers of the geologic column are found from the top of great mountains, like Mt. Everest and the American Rockies, and is found in the lowest cuts of the earth, such as a mile deep into the Grand Canyon. Are the Earth’s layers like a Peel-able Onion? When some people visualize the geologic layers, they commonly think of the entire earth like a peel-able onion, whose skin of successive structural layers or strata, peel away deeper and deeper revealing each of the geologic columns. In other words, most people believe that the geologic columns cover the entire globe! This is not the case at all. On a global scale we find the ten periods typically used to define the columns are poorly represented. Roughly 75% of the earth surface and ocean area have 7 or more of these layers missing, 94% of the total surface area is missing 3 or more, and only .04% actually have 9-10 of the layers. Even in each places where the column is represented by all 10 layers it still has incomplete systems (Nepal, Bolivia, Poland). – Dr. John Woodmorappe, geologist “The Essential Non-Existence of the Evolutionary Uniformitarian Geologic Column” CRSQ Vol. 18 No. 1 June 1981, pp. 46-71. In order to achieve such a ‘complete’ geologic column, including a match to all theoretical timelines, it would have to be approx. 100 miles thick, or twice the current maximum thickness of the crust of the earth. The depth of most geologic columns Geologists observe are only approx. 1mi thick. It needs to be understood that no where on earth has a ‘complete’ geologic column been found, for obvious thickness and depth problems. A complete geologic column would include every sedimentary layer from every time era, period and epoch, all including each of the 34 index fossil in each layer. The layers have been given their labels and related values based on comparisons between rocks in each locations and assuming uniform conditions. Uniformitarian Geologists assume that each geologic strata had uniform conditions in each distant location for the duration of their formation. The Basement Rock beneath the geologic column is inconsistent with typical geologic formations, and reveals nonconformity when compared to al layers of the geologic column.The basement rock in geology is the reference to the rock bed underneath the sediment rock layers. 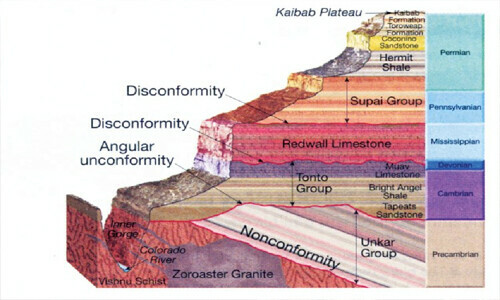 Nonconformities’ are inconsistencies found in the earths strata layers. Assuming a uniform consistent deposit of the earths strata layers, we should expect conformity, or similar type structures all throughout the earths crust. Interesting enough, that we find as far down as we can go, the last uniform layer is the Cambrian strata layer. Beneath the Cambrian we find the sediment and strata layers are completely random and jagged and even mostly displaced in vertical like direction. 2. One underlying remaining ancient layer, known as the ‘basement rock,’ where there seemed to be an underlying large water system that broken through to the surface under a tremendous amount of pressure. This cause the hydrologic sorting of the top or upper sedimentary layers. Geologists use machines to drill deep into the earth to take what is known as ‘core samples.’ These core samples are carefully extracted and different sediments are measured to determine what and where different layers are located in a specific area. Core samples are taken so geologists can measure just how deep each sedimentary layer is deposited and what kind of sediment is on top or below different depths. While examining the column data provided by different Geological surveys, you will notice several thing while attempting to matching up the core samples. These are various core samples displaying strata layers extracted from different areas. At first glance it would appear that everything is pretty well lined up throughout each of the core samples, and that the geologic columns from different areas appear to be pretty uniform across the board. Now, draw your attention to all the ‘white unlabeled sections’ within each of these core samples, these are GAPS. Primarily you will see that there are huge gaps in-between each and many different presumed ‘era’s’ when compared to one another. Evolutionist will state that over millions of years certain sediment layers where washed away and will not be included in a specific sample. 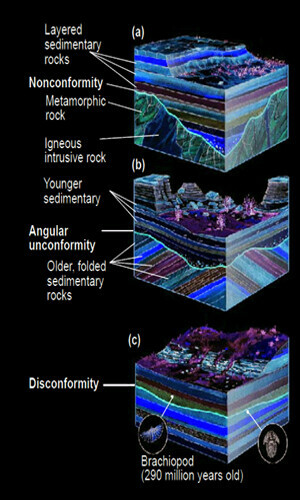 The fact that each sedimentary layer is supposed to represent millions of years yet many of these layers are found in one part of the world and not in another makes the uniformitarian assumptions less likely. It is unreasonable that we would find no representation AT ALL for these missing layers if millions of years did indeed occur over the earth in these locations. It become more evident that the sedimentary layers of the earth formed from a global catastrophic event. Depending on the sediment stirred in the ocean while Noah’s flood was occurring in different geographic locations, there would have been different sediment types (limestone, sandstone, clays, shale, etc.) that would have began to settle, and where re-stirred continually (by multiple events such as the ocean tides, jet streams from the underground water sources, torrential underwater mudslides, etc. ), being sorted by weight and density, as they where lifted and settled each day. Traversing layers are layers that through tectonic movements and earth slides causing one layer of earth to either overturn or protrude and cover another layer. These effects leave devastating wakes and evidence whenever they occur. Many such effects are called overthursts. Geologists have found that none of the samples taken from any geologic column matches uniformly to any of the other locations in the world. Different index fossils are found all throughout the columns as well as bones and other fragments from a multitude of different types of creatures. Evolutionists attempt to use Geologic observations in attempt to prove uniformity, yet the data proves otherwise. 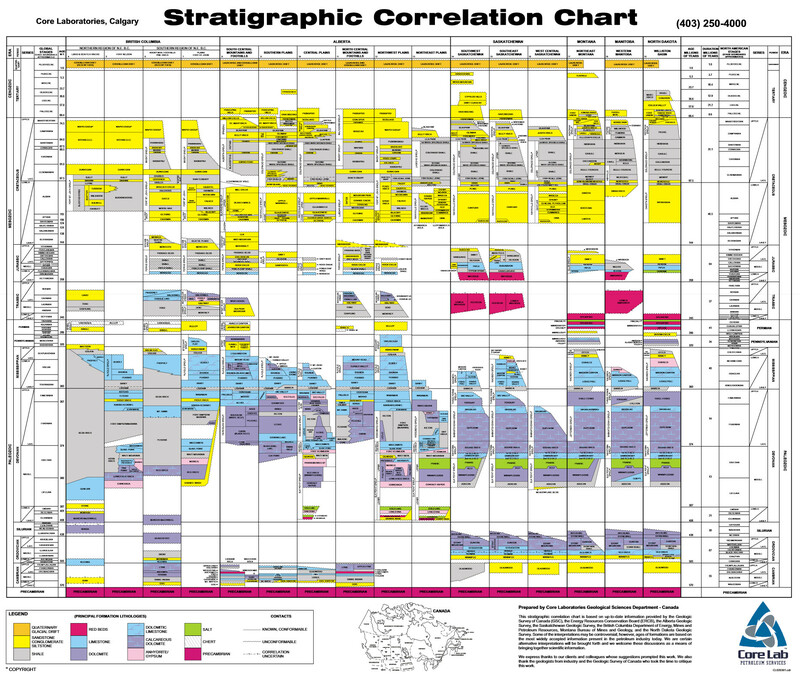 Stratigraphic Correlation Charts affirm that core samples taken from multiple areas have a large amount of differences between one another. 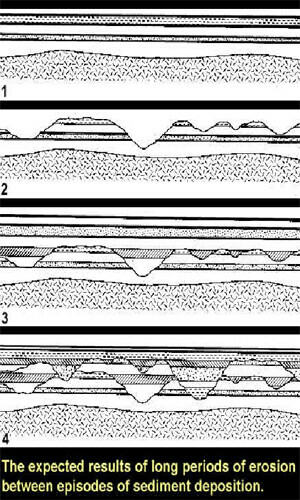 Evolutionists like to point out that the rock layers seem to be in uniformity in all their data charts. Although, this data also shows exactly what we would expect to see if the layered sediments where attributed to flood waters settling by the densities of the rocks, sand and mud. 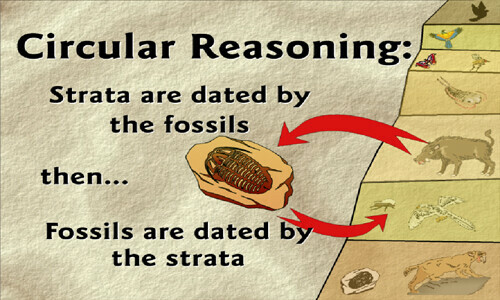 Fossils used to attribute the age of each layer are not ordered as expected by uniform theories, as the represented time era of each fossil is inconsistent when found in multiple strata layers. Evolutionists like to use the ‘over thrust’ concept when they find layers or fossils ‘out of place’ from their conventional geologic charts. The over-thrust layers occur when, through tectonic movements or other natural earth movements, a ground strata layer is moved and shifted above/below another. This effect leaves plenty of evidence behind when found in nature. The following examples for layers out of place cannot be accounted for by the over-thrust concept, because there is NO evidence of any geologic activity occurring that would cause these layers to be ‘out of place’. Identified in 1901, an area encompassing the Glacier national park, and seen specifically at Chief Mountain. Its area encompasses more then 300 mi long, 20 – 50mi wide, 3 mi deep and represent Precambrian strata (1-2Bya) above the Cretaceous (150 Mya). All the fossils found are in the wrong order. The contact line between the two strata is knife-edge like suggesting that instead of an overthrust, they where water-deposited in that order naturally. Evolutionists suppose the Precambrian era was the age before life evolved, and the cretaceous the age of dinosaurs. 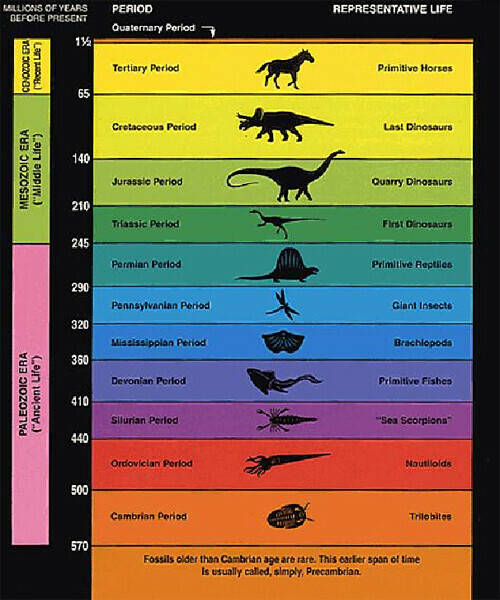 The only way the evolutionary geologic time column could be accurate here is if the entire rocky mountains lifted and move 50 miles east without leaving any trace. Þ further research please look at answer criticism. The W. Crazy Cat Canyon near El Paso Tx. scientist have found massive Ordovician limestone on top of cretaceous strata. fossils found completely out of order are the cretaceous was a time of the dinosaurs and Ordovician was the age of sea life. There is no indication of movement between the two layers. At 21 mi long in Glarus Switzerland, the order of Eocene (youngest) is at the bottom of this mountain range, followed by Jurassic (older), and on top Permian (oldest). If the geologic column was accurate this would be an impossibility. Two layers over thrusting is possible, but 3 in this manner is impossible, but more evidently, there is no observable evidence to show that any geologic activity cause such deviations. The empire mountains of Arizona have been capped with Permian limestone on top of Cretaceous rock. The dividing line between the sediment layers is irregular and jagged. If an overthrust had occurred the formations would have smoothed off any irregularities and made it a linear separation point. There is no imbedding or scrapping found between the two layers as evidence of any type of geologic movement. This beautiful red, yellow, purple sandstone topped with Cambrian limestone canyon is located just 35 miles W. of Las Vegas. This poses a major problem for the evolutionist as over-thrusts over 150 mi would be needed to account for the out of place formation in 2 separate places, or that the exact same out of order sequences happened in 2 different places with a 60 mi gap in between. Creationists would view this as further proof of the flood waters laying down the sediments in the same sequence, according to the materials density, in the two separate locations at the same time. These mountains from Tennessee to North Carolina, show two extremely large thrusts at a low angle containing out of order strata and very little evidence of movement. The fossils found here are out of order. This thrust would have been 300 Mi long and 9 Mi wide, as it would seem this could only occur if the entire layers where still wet to make such a tectonic movement possible, thus indicating a catastrophic flood must have occurred. 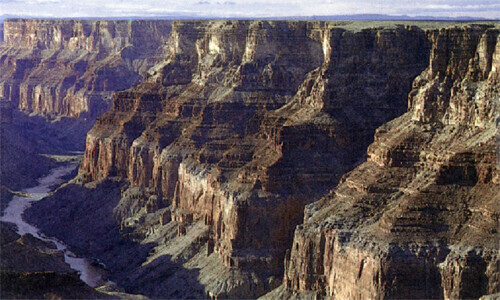 The grand canyon is whole mess of problems for the evolutionist. There are gaps everywhere of missing ages and in other places multiple interblending of Mississippian and Cambrian strata layers. 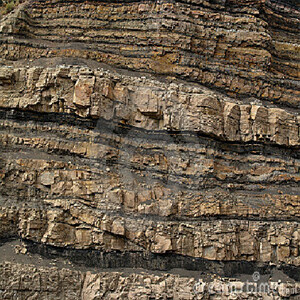 How could different layers be millions of years apart when they are shuffled together like a deck of cards? Research has documented over 500 such examples of strata not reflecting what evolutions should expect if the geologic time column was reliable. In fact this leaves the evolutionist with very few examples of columns that outline the order they need in order for their time scale system to work. One of the chief problems for the uniformitarian theories is that their belief states that the geologic columns where formed over millions of years. This is one of the most difficult and even more catastrophic issue for evolutionists to overcome. Throughout thousands of examples and places throughout the earth, multiple ‘polystrate fossils’ have been discovered. These are example of organic matter or other compounds that protrude through multiple layers of the geologic column. This 30 foot petrified tree is one of hundreds found in the Kettles coal mines near Cookville, Tenn. The top and bottom are in different coal seams dated thousands of years different in age. Examination of this phenomenon is hard evidence that the strata layers in the geologic column did not form over millions of years, but due to the torrential waters of a world flood over just a few years. A flood that happened long enough to uproot and bury these fossilized trees in multiple sedimentary layers. Weak arguments against this phenomenon do not paramount to the fact that we observe these polystrate fossils throughout multiple layers of sediment all over the world. Uniformitarians believe the top and bottom of these sedimentary layers differ from each by a time span of millions of years. It is impossible for one tree, let alone countless other trees and fossils, to stand in an upright position for hundreds of millions of years while the sediment formed around it. There is a prime example of this polystrate phenomenon that took place at Spirit Lake. As the trees where deposited in the depths of Spirit Lake, they had multiple sedimentary layers, sorted by hydrologic densities, deposited around them in a short timeframe. This was a perfect example, on a smaller scale, of what would be expected if a global flood would have uprooted and redeposit different trees around the world in the same manner. Scientists estimate there are 20,000 trees in the bottom of Spirit Lake. Many of them are buried upright and some are already 15 feet deep in sediments. These trees as they are covered in sediment, seem to settle out by species, due to different densities, giving the appearance of a complete forest. The first point is that for some reason evolutionary geologists only consider polystrate tree fossils found in ‘situ’ to be valid. In ‘situ’ meaning that they where not disturbed and are shown to still be rooted in place where they originally grew. 1.) 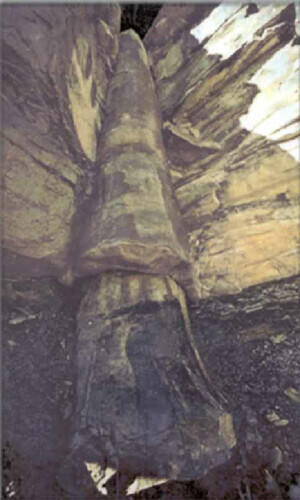 They claim that you can validate how a tree fossil geologically protruded through multiple strata and therefore it remains invalid unless it had rooted and remained in the exact same location as it original discovered location. A.) This claim is just a way for evolutionists to dismiss and to try and invalidate a considerably large claim against their theory. 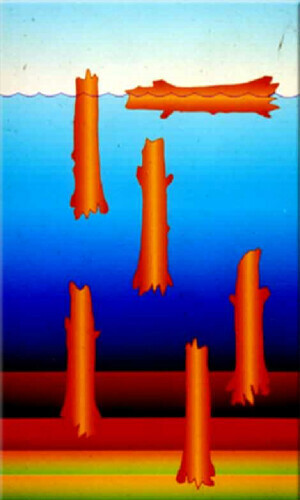 Considering the amount of evidence of trees found in the polystrate position throughout the world protruding through multiple layers, if anyone makes the assumption that it took millions of years for those layers to develop, the evidence remains that these fossils where positioned at the exact same time the layers where made. 2.) The second claim is that the polystrate tree fossils are not poly’strate’ at all, but are actually found in only one layer per each tree! A.) This claim is proven false at nearly every location, as this early evidence for polystrate fossils reveals [an old newspaper article with findings from Kupferdreh Germany]. These tree fossils have been recognized as protruding through multiple layers. One strata layer of a geologic column can range from a few feet up to hundreds, based upon whatever index fossils a geologist finds, at what depths they are found, and whatever additional information is dismisses such as missing gaps. Even IF the trees where represented in only one strata layer of the geologic column, according to geologists, every inch would still represents hundreds to thousands of years. Any place these polystrate trees are found in t he making today proves it only takes a few years, if that, to lay down extremely large amounts of sediment in multiple strata formations. So, How did the Earth’s Strata Really Form? We find layers beneath a certain point (Precambrian) are completely non-uniform and jagged until the segmented layers above, and in fact are seen to be vertically jagged, as if something in ancient times had pushed through the crust of the entire earth. These observations among many other in the geologic columns, would point more towards the Biblical account of the waters of the deep breaking through the crust of the earth. Then through years of oceanic activity and tides over the whole earth, the massive amounts of thrown up sediment would be divided into layers using the process of liquefaction to devise what we observe today. 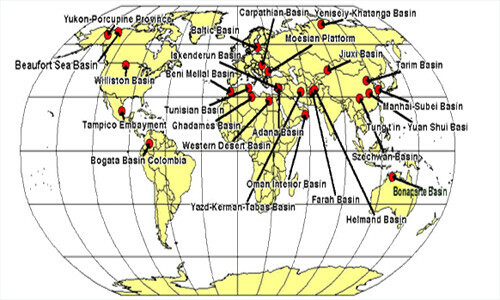 column locations- Sources: Robertson Group, 1989; A.F. Trendall et al , editors, Geol.